His grave disappeared in the 1840s when the original Euston station was expanded into part of the cemetery. 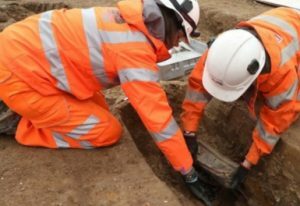 Construction workers building the new London-Birmingham high-speed railway line have unearthed the grave of the Royal Navy sailor who gave Australia its name. For 180 years the last resting place of explorer and navigator Captain Matthew Flinders has been lost among 40,000 other bodies in graves near Euston station. But archaeologists excavating St James’ burial ground to pave the way for the new HS2 terminus have identified the officer’s grave out of the thousands at the site. The lead depositum plate – breast plate – put on top of Flinders’ coffin when he was buried in July 1814 meant his remains could be formally identified. As commanding officer of HMS Investigator, Flinders sailed from Portsmouth in 1801 to conduct the first circumnavigation of Australia – confirming it was a continent. Although he wasn’t the first man to use the term, his account of the voyage – “A Voyage to Terra Australis” – gave the new land its popular name. His grave disappeared in the 1840s when the original Euston station was expanded into part of the cemetery. The headstone was removed and it was feared Flinders’ remains were lost; for a long time a myth persisted that he was buried under Platform 15.